Within the first two weeks of each semester, studio arts major Stephanie Taylor can usually expect to sign an accident waiver form. “The professors always tell me, ‘Be conscientious because your biggest material is your health,’” Taylor, a junior, said. 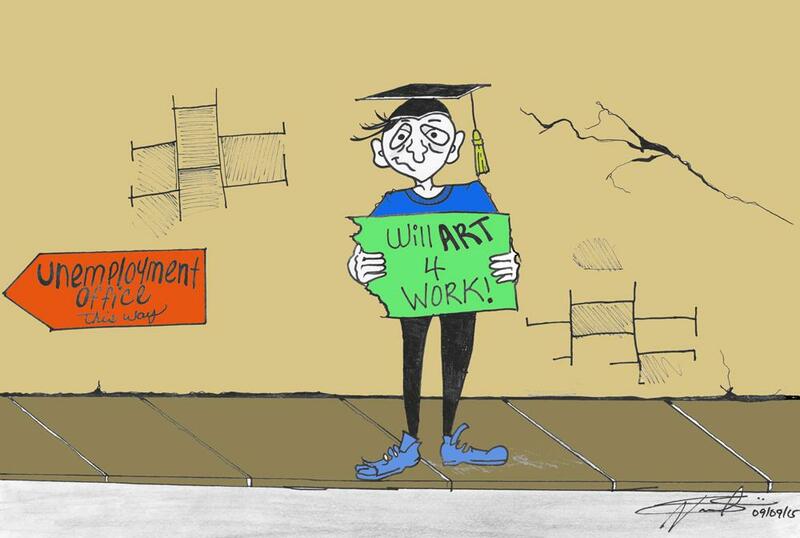 With art degrees come physical ­— and employment — risk. Unlike most students nearing a project deadline, Taylor’s heard rumors of studio arts students who’ve cut off their hands during last-minute rushes to finish projects. She even knows one peer who almost lost a finger while using a paper cutter. And that’s not including potential allergies from painting materials, which often worsen her own asthma — partly the reason why she’s transitioned to printmaking from oils and mineral spirits. For Taylor, who is pursuing a career as a visual artist, health concerns are just one of the many challenges that separates her work from other majors. The biggest obstacle, however, comes after graduation. Along with studio arts majors from many other U.S. colleges, Taylor expects to enter a difficult job market full of visual artists hoping to make a career of their personal work. According to Nicole Scalissi, a graduate student in the history of art and architecture department, in her experience,many studio arts majors rarely become full-time practicing artists. Forbes magazine recently ranked fine arts as the third-least valuable major, based on “high initial unemployment rates and low initial earnings.” Film, video and photography arts was second-least valuable. With this knowledge of the industry, many students often enroll in M.F.A. or Ph.D. programs instead of seeking work right away or enter different fields utilizing the skills they learned in undergrad. Scalissi said these jobs include managerial positions in corporate retail — due to the amount of creativity required for the position — and manual labor, including carpentry and shipping. The students who enter studio arts M.F.A. programs, she said, sometimes become curators or serve residencies at art institutions around the country. Before deciding to study art history in undergrad at Pitt, Scalissi once considered becoming a graphic designer, then pursuing a career in creative writing. At the time, graphic design was a lucrative opportunity, but the recent recession resulted in the layoffs of many graphic designers. Eventually, she decided to teach, research and write art history, which combined the critical skills she learned in studio art with the curiosity and creativity she used in her creative writing. Taylor — who would’ve considered majoring in biology if she hadn’t punctured a pig’s lung during a dissection in high school — is optimistic, but realistic, about her career prospects. Printmaking, she said, is more economic, as she can sell more prints at a lower cost. Last spring, her art was featured in a show by the University Arts Gallery. She also received a grant from the Office of Undergraduate Research last summer to experiment with her next project, a series of screenprints inspired by the myth of Icarus. In the future, Taylor might follow the paths of her close friends who have graduated from Pitt’s studio arts department. Many have since worked as interns and assistants for established artists, helping with installations at museums such as the Mattress Factory.